Anne Boleyn is without doubt the most famous of Henry VIII’s six wives. She was brought up for a time under the guardianship of Margaret of Austria, who was patron to some of the most famous composers in all of Europe, and then in the French court before her return to England in 1522. 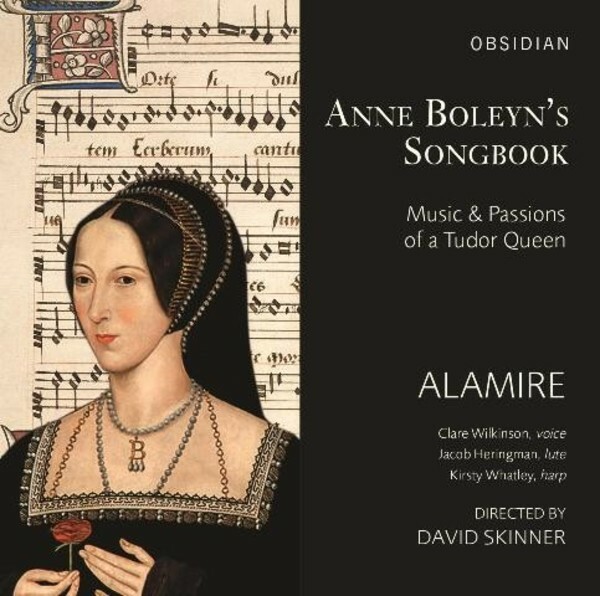 It was in France where the young Anne developed her keen musical tastes, and when a collection of her favourite works began to be assembled into what is now known as the Anne Boleyn Songbook (Royal College of Music, MS 1070). The book probably remained in her possession until her execution in 1536, when she was accused of adultery with no less than five men including her own brother, George, and lutenist Mark Smeaton. Here Alamire explores the finest works in the Songbook by the greatest composers of the early 16th century, including Compère, Brumel, Mouton and Josquin. Performances by Alamire are interspersed with French chansons and instrumental items for lute, harp and voice. The programme concludes with a most haunting setting of ‘O Deathe rock me asleep’, not from the Songbook but possibly linked to Anne’s fate while awaiting her execution in the Tower of London.